Between birthday's and Thanksgiving, time has been pretty short...but it's been a fantastic time to take a mini break from blogging. Ella turned 5...that's a once in a life time thing! 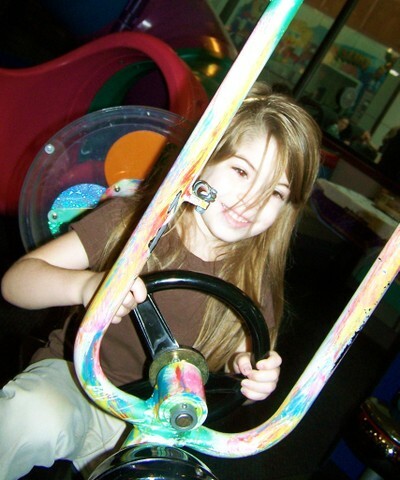 She REALLY wanted to go to Chuck E. Cheeses. We have never been ...actually we've been avoiding it for 13 years! LOL! But she had a blast and it was an enjoyable day for all of us! I'm totally freaked out by how much she has grown in the last few months. She's such a peanut, tiny and energetic. I can't for the life of me keep any clips in her hair so we are growing out her bangs so we can just pull it all back into a ponytail. Pepper had her 9th Bday this month too! (Yes...3 b-days in the space of one month...and it just knocks me out by the time we are finished with thanksgiving!) She had a giggle fill party that included 9 extra girls... so with ours that's 13 girlies hoppin', screamin and gigglin'! 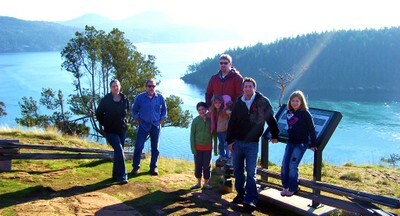 It was a blissful day here in Anacortes... Sunny and bright. We were lucky to have some of my family up for the occasion and it was a wonderful day to give them a mini tour of the island and area. We saw seal, this cool pair of birds that I am still in search of their species and were able to even walk on the beach! ( I swear, on the next sunny day... I am there! Even though its winter, it was warm enough to take a walk on...wearing my coat of course!) here is my Dad, my Step mom Lynn, by Bro Tony with us at Washington park. 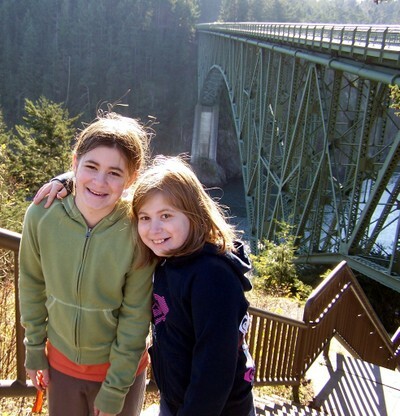 Here is Hannah and Pepper at Deception pass. This bridge connects Fidalgo Island to Whidby Island. I cant wait to scrap these pictures... such good memories! It's SO beautiful here... I keep thinking how fun it would be to have a stamping retreat here. Stamp, walk on beach, stamp, look for whales, stamp, tour the San Juan islands. Hmmmm.... Any thoughts? Ok... back to work I go. got some creating to do today. Thanks for dropping by! Well today was a fun day over at Splitcoast as they kicked off the Inaugural Diva Designers Challenges. Nichole, Amy, Taylor and I were lucky enough to participate as the first Designers to post challenges...and let me tell you... it's been a blast! This is my first time ever hosting a challenge. I have been pretty intimidated by it to be honest... not totally getting how to write one up. Now that it's done it seems silly that I stressed out about it so much. The other ladies were gracious enough to share their write up's ahead of time and they were life saving! Thanks Girlies!!! 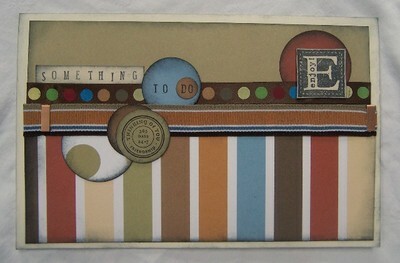 My challenge was to create a layout using raw cardstock and no pattern paper. Feel free to join in... Just upload your layout to SCS with the keyword SBDD01LISA . I get to chose a winner too and send a little somethin' their way! You have about a week to play! So this page is one that Ive been mulling around for a long time. You might recall the MANY time's I have shared about my fear of pattern paper. 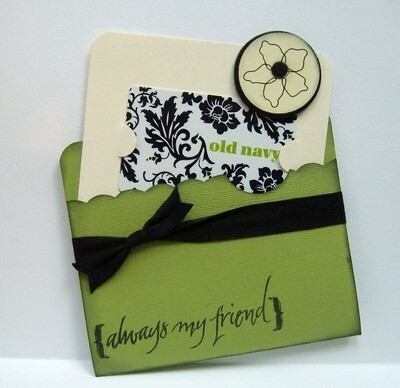 Yes, silly I know...but I absolutely LOVE creating with raw cardstock! There is something almost therapeutic for me when I make it come alive...not to mention getting to sponge those edges... *sigh* pure happiness! now don't get me wrong... I am no longer phobic about pattern paper... but raw cardstock is like comfort food to me! Now... doesn't Prism have beautifully colors! 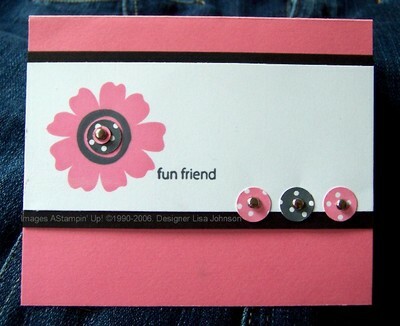 It's a great weight, not to thick but still thin enough to be flexible for cut out embellishments. Papertrey images were used for this page... I love what I can do with Nichole's sets... She is a genius! Please let me know if you post somthing in your gallery to participate in this fun challenge... I cant wait to see your pages! It's time again for that much anticipated Papertrey Release! I'm always blown away with what amazing things the other ladies come up with... Amazed is really an understatement! I thought it would be fun to create something Elegant using Spiral Bouquet. When I see fine lined images like this I think Technique and Crayon Resist came to the front right away! 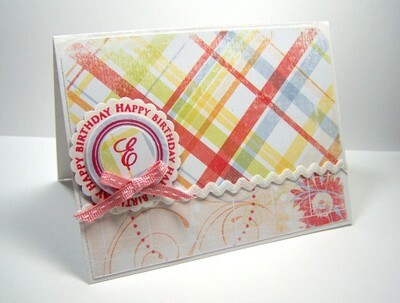 Prism has great Polished White cardstock for this! Ella helped me with this one. She saw me stamping and said "Can I stamp with your tree Mommy?" I looked over puzzled at what she was talking about... there's no tree in this set... And there it was... sweet girl was seeing out of the box! I was considering making just some tags... but went ahead and worked it into a simple mini note card. My thought is that I could insert a gift card on the inside then hang it from the tree as a surprise present for someone! Now... I just fell in LOVE with the new Monogram sets that Nichole came out with... Sweet AND Elegant all at once! 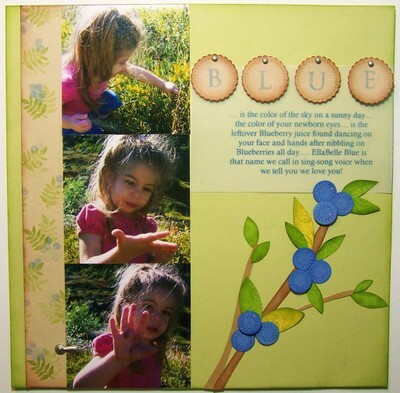 Creating with these is EASY to do and they lend themselves well to ANY pattern paper! What FUN! I Used WeR's fantastic White Out Line Paper and trims. I love being able to curve clear sentiments! now at the time I didn't have anything really yummy in house to stuff in there... but this smartie will give you an idea of size. I actually think a little Almond Roca would look pretty cute in there! 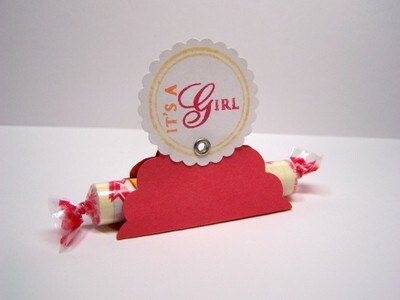 Ito create the word "girl" I simply stamped the G first the inked the "irl" on the clear stamp... easy peasy with clear stamps to line those up and just make it happen! 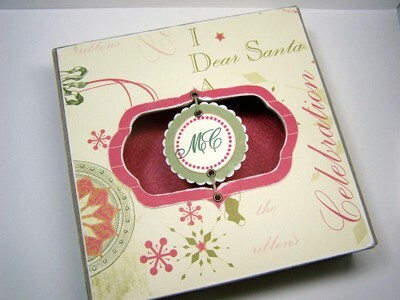 Finally I created this Christmas Keepsakes box. Every year we end up getting cards and photos...and I hate to throw any away. I typically just put them in a little pile and store them away with the decorations. This box will act as a keeper of those items. That way when New photos come every year we can pull that box out and compare to see how each family has grown! I used Webster's Pages Lovely Christmas Line for this box. There are a few details that I had fun creating... the suspended Monogram center and the outer paper frame. these little details took time but I think they really add to the finished project. Also sanding helped define the edges on this box...adding to the rustic, yet elegant feel I was looking for. Now... if you haven't already ...check out Pine's box.... HOLY COW! Her designs just take my breath away! Thanks for stopping by... Hope the rest of the day brings a smile to your face! I'm constantly enthralled by interactive cards. Over the years I have seen tried and true as well as flashy and new and they always make me smile. I'm currently trying to compile a personal list of interactive card styles. Wouldn't a master list of folds and tricks be fun. It's probably already out there but I haven't stumbled across it yet! LOL! Here is what I have just off the top of my head. I will continue to add here as you post in the comment section! If you have a link to a sample to share that would be great...sometimes we call the same type of card by different names so that will help! Now... there are several that I know how to do and don't know the actual names...so I make up my own little description. Trust me...its a tad sad. thingamabob and doohicky seem to slip into my descriptions a lot! LOL! So the question is.... DO YOU know the names of any additional interactive cards? If so... post a comment with a link to where we can see one or your own example! I LOVED this set when Stampin' Up came out with it... I stamped my little heart out and found that this set was an easy one to use for a clean look. (the name of this set alludes me right now though.) 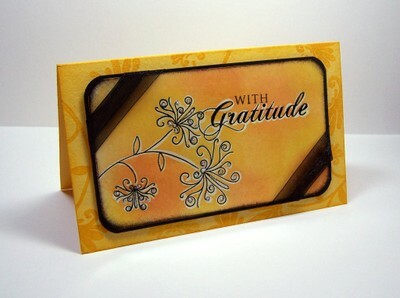 I LOVED how Fluid Chalk Ink by Clearsnap helped create a matte feel to this card. It's always fun to take a larger patterned image and punch out something smaller from it... that's what I did here with the polka dot circles. To keep with the matte feel I sanded the brads to give them a flat finish. This fun card made it's way into a Scrapbook trends publication a few months ago and they did a way better job photographing it than I did! :) It always amazes me how an old layout can feel new again when you use different colors or stamps. When I first started stamping everything had to be in the center. Now I'm all over the place... and having fun doing it! Ahhh....in a house full of girls, this sentiment is alarmingly true! :) What are little girls made of ...Sugar and spice and everything nice! It came to mind while working on a Papercrafts call for nursery rhyme themed projects. 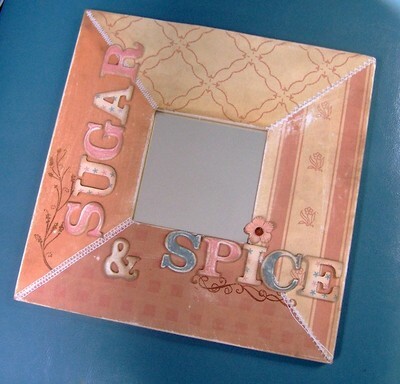 I was SO inspired by the theme that I created this mirror and was lucky enough to have it published in their March 07 issue. Now let me tell you... this looks way simpler to create than it was to design BUT it was those difficulties that helped form the design for me. I wanted mitered corners and wasn't smart enough at the time to create them in a simple way needless to say some of the joints ended up...well, off. I originally intended this to be a clean project...no distressing or sponging. So I started sanding and smoothing the seams. lets just say that I was REALLY grateful for these Autumn Leaves rub-ons that day...Instant fix! No I had added a new element that I hadn't planned and changes style. So I start stamping....I really struggle using Autumn Leave clear stamps because they seem to take flying leaps off my acrylic blocks. this happened here actually and there were some lines that needed to be covered up or erased.So right under the "P" you will see a heavily sanded area...yep that's one spot. then under the flower is another. Strategic placement really helped. Then it happened again over sugar but it came off after the stamp hit the paper. While lifting it off some of the ends of the branches smeared. OK, so I am pretty committed to this mirror and I wasn't giving up! so out came my handy dandy stickles and I added yet another product that I hadn't intended to use. So, I had to place the letters in a different spot than intended, add a flower, sand and use rub-on stitching and cover some blurry images with Stickles. LOL! Now think back to all those designs you started and threw away because of what you consider to be a mistake. Well, I have learned that mistakes/flubs are just a change in path and an opportunity to move forward exploring possibilities. I absolutely loved how this mirror turned out. It's rare that I think that about projects I make but I knew when it was done that it was special, unique and would find a space in my home! Fast forward... So here I am with blank white walls in my downstairs bathroom, which is like giving a stamper a lovely piece of good white cardstock. I unpack the mirror and look at it with astonishment still not believing that I created it...and it dawns on me OH MY GOODNESS!! !...I totally need to decorate my bathroom around it! Now I have my next mission...that will be the next room painted. I will take that mirror to the paint store and coordinate it with something lovely. I also want to make a little sign for underneath it that says "and everything nice!". Oh what fun...a shabilicious bathroom! 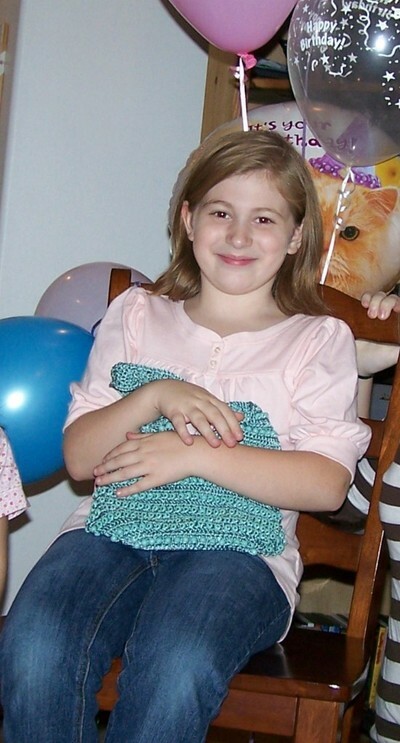 Do you have any projects that you have fixed or morphed? Here are a few that I wanted to share with ya! this quickie was found in Cards Mag. totally simple...but I really liked how it turned out and tied in with the gift card! 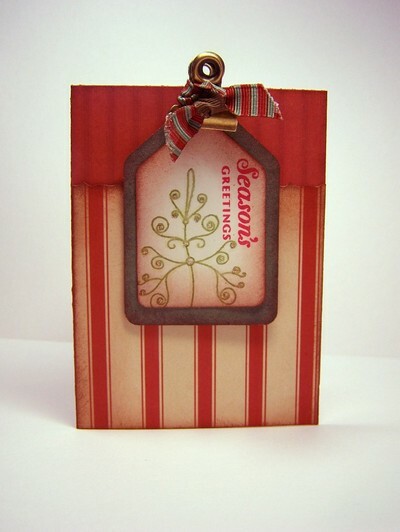 (Hampton Art stamps, Scenic route paper & Chipboard. Well...off to bed I go. Pepper turns 9 on Sat. and I have a big party to plan and tomorrow is planning day!